Our Majors curriculum fosters learning in all curricular areas; thus, preparing our students for higher education, lifelong learning, and a wealth of career options. All middle and high school students deepen their knowledge and expertise within their Major, as 90 minutes per day is devoted to the pursuit of content and practices in a rigorous discipline of study either in the Sciences or the Arts. Each Major program delves deeply into the subject, and students cultivate an immense skill set at the conclusion. As students develop within their Majors, internships and other opportunities exist to work with professionals in their chosen fields. The Classical Ballet program is designed to develop technically sound, artistically conscious, and stylistically versatile dancer-artists. The curriculum is centered on Classical Ballet with an emphasis on establishing strong classroom technique and performance ability. Technique classes for female students include pointe work. Students are assessed on technique facility, classroom etiquette, and performance, as well as an understanding of dance terminology and history. Ballet majors study choreography and have the opportunity to create their own work. Strong classical ballet technique/pointe technique and a strong desire to continue training and strengthening that technique. Serious about developing classical ballet technique and remaining open to versatile ballet styles and performance themes. Knowledge and interest in history of Classical theatrical dance/ theory. Performing throughout the year and after school. 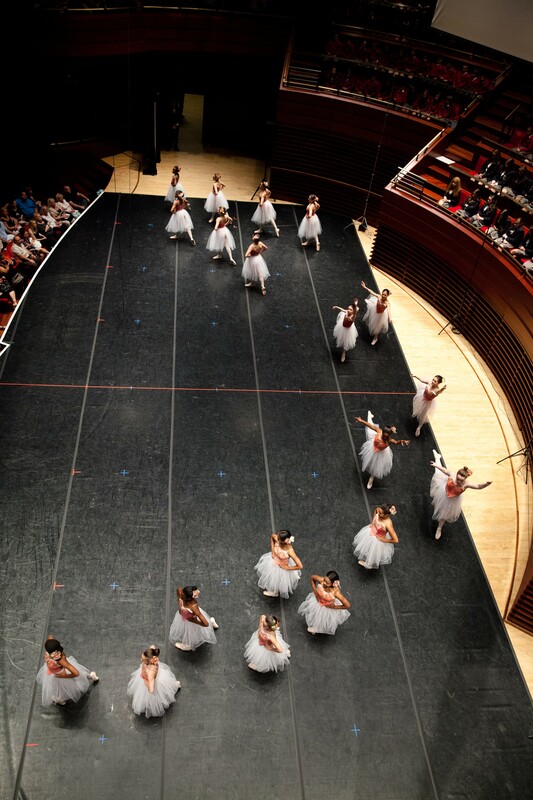 The Contemporary Dance program prepares students to become well-rounded performers. The Major includes many different styles of dance including contemporary ballet, modern, and jazz dance techniques. Students are given the opportunity to perform in these versatile genres. Students are required to conduct theoretical research on specific styles to fully understand each technique. Not only do students enhance their physical abilities, but also expand their knowledge of the many styles of choreography used in the professional arena. Through the study of Contemporary Dance, students have the opportunity to create their own work. Strong desire to continue in the Contemporary Dance field through 12th grade. Dance and perform in after school and outside performances, including after school rehearsals for musicals, masterclasses, etc. Interest in furthering knowledge of Contemporary Dance technique. Interest in cultivating knowledge for all aspects of dance productions, including backstage management and the technical side of performances. The S.T.E.M. (Science, Technology, Engineering & Math) Majors program emphasizes project- and problem-based experiential learning. Throughout 5th-9th grades, students receive a solid foundation in life & physical science, engineering & computer science, and question-driven experimental design. These broad experiences provide students with the opportunity to hone their S.T.E.M. interests and focus their high school S.T.E.M. experiences down a biotechnology/life sciences or engineering/robotics track beginning at the 10th grade level. The Biotechnology & Life Sciences curriculum includes a foundation in laboratory and biomedical sciences, life sciences, environmental science and sustainability, and the social and ethical questions associated with advancements in these disciplines. Students learn to read, synthesize, and draw conclusions from scientific publications. Students develop the foundational knowledge to design and conduct their own biological experiments in response to relevant questions in the field. Engineering & Robotics students receive a foundation in engineering design principles, CAD design, fabrication, computer science, robotics, and electrical and mechanical engineering. Students develop a thorough grounding in the principles and practices of robotics, as well as the scientific and mathematical principles upon which they are built. Courses are focused on advanced concepts in engineering and programming to provide students with the foundational knowledge to examine, innovate, and create technology. Embrace the value of iteration. Aptitude for Science & Math. Students enrolled in the Vocal Music Major develop an understanding of music composition, theory, and production. Through the refinement of their technique, students increase their ability to identify the components of musical sound and enhance their capabilities for composing and performing. Students become musically literate, familiar with music of other cultures, and able to write and create short rhythms and melodies. Vocal Music Majors are members of the school’s Concert Choir, performing throughout the school year. 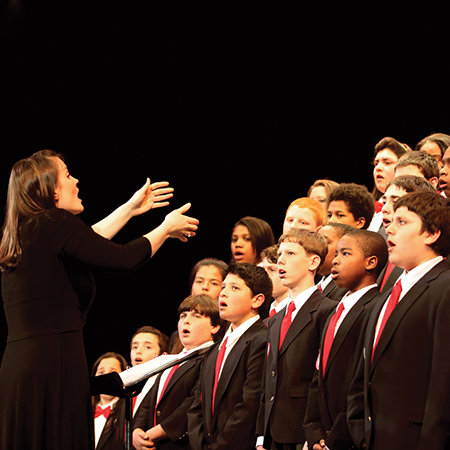 Various choirs are created based on the interests and abilities of the students as they progress through the major. Have a strong desire to sing every day for at least 90 minutes and be available for after school and outside performances. Be willing to sing alone and with a choir (solo work is not a large part of this major, but students take performance tests individually). Be interested in learning how to read and write music. Have the self-control and focus necessary to contribute positively in a large-group setting. The Instrumental Music Major focuses on developing a student’s understanding of music concepts that serve as the foundation for future development of aesthetic judgment. Students apply knowledge and understanding of the elements of style, form, and cultural heritage to listen to, perform, create, and defend their musical choices. In both Instrumental Music Major tracks, students explore career possibilities in music education, music composition, the music business, and music therapy. Both tracks play an integral role in school performances and attend various outreach programs during the school year. String Orchestra focuses on continuing the development of skills on the violin, viola, cello, or double bass. 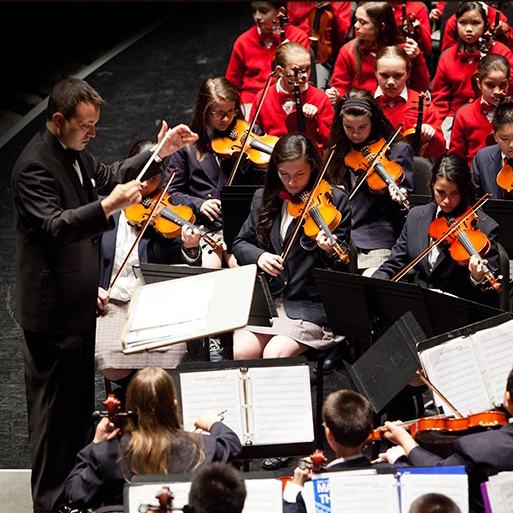 Middle school and high school students, depending on their level, are placed in beginner, general, or advanced ensemble. Concert Band track will continue to develop skills on woodwind, brass, and percussion instruments. Have a strong desire to continue in this Major through 12th grade. Be available for after school and outside performances. Already play an orchestra string or concert band instrument (violin, viola, cello, double bass, woodwind, brass, or percussion), or be willing to work hard to learn. The Drama and Musical Theatre tracks introduce students to performance through the theatre discipline. 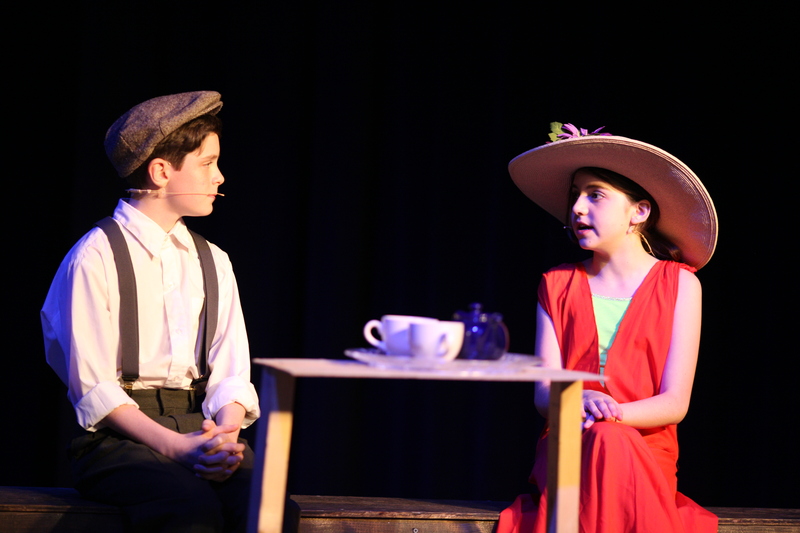 Students develop skills such as speech articulation, problem- solving, critical thinking, teamwork, and responsibility through scene study, character development, improvisation, and movement. Students are introduced to basic theatre terminology. Additionally, students are introduced and expected to participate in all aspects of theatre, ranging from acting to set design, to costumes and makeup. Within the Musical Theatre track, students are trained in Broadway dance and vocal music to round out their theatre education. Drama and Musical Theatre Majors develop confidence in their individual ideas and abilities and experience self-growth through artistic expression. As students progress through these tracks, they continue to develop and strengthen the necessary skills to enhance their performance quality. Strong desire to develop the skills necessary for improvisation and performance. Commitment to rehearsals: both in school and after school. Willingness to work in groups. Understanding that theatre goes beyond performance and students must participate in all areas of the art form. Ability to take and apply direction on performance. Students who major in Television & Broadcast Arts explore and navigate through the ever-changing field of visual communications. From film to television, to online content, TV broadcasting offers students the opportunity for hands-on experience in front of and behind the camera in all aspects of video production. The Major guides students from the evolution of an idea, into a fully planned project, through production and into post-production, editing and marketing. Students see their ideas come to life and become visual content creators. This course prepares students for college programs and careers in video production. Ability to handle expensive camera, sound, and lighting equipment in a safe and responsible manner. Desire to write stories and transform them into a visual realm. Willingness to film after school events such as concerts, plays, exhibitions, and more. An interest in how film, television, and media are used to shape our society. Strong desire to use the information and skills mastered in this Major towards a degree and/or profession in media communications. Students who major in Creative Writing explore the genres of fiction and nonfiction in poetry, scripts, podcasts, and stories. The best writing pushes into the reader’s mind and soul. It creates worlds that ensnare the senses and characters that capture the imagination. Creative Writing students examine writing techniques that authors use to craft amazing works of literature and apply these techniques to their own stories. 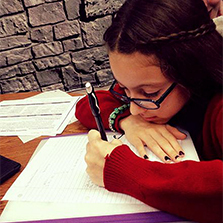 The techniques students study and utilize include setting, character, theme, plot, and sentence construction. Students are encouraged to explore their passion in writing by setting and meeting their individual literary goals. Individual pathways vary from creating a weekly podcast to drafting an original novel. In addition to individual studies, students learn to peer edit and produce group works and projects. Students are responsible for researching, brainstorming, drafting, editing, publishing, and presenting their own original works throughout their enrollment in the Creative Writing Major. The ability to understand and apply the writing process. Interest in advancing writing abilities. Open to sharing work and collaborating in groups. Desire to be creative and explore different forms of writing. Interest and ability in peer editing and both providing and accepting critique. The relationship between fine arts and digital design is a fluid one. Fine artists use technology and digital artists depend on classical drawing and design skills to support their work. 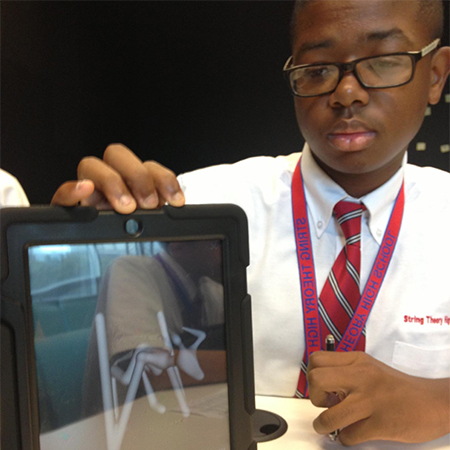 Middle school Students in Digital Design & Fine Arts Major develop both technological and fine arts skills. Students study and discuss works from distinguished artists in each medium, examining current techniques and applying these techniques to projects assigned in this course. Students individually produce material for each medium to submit for critique, discussion, and grading. Student learn to both give and apply constructive criticism of peer work. By high school, students choose an area of expertise on which to concentrate their studies. Students focusing on the Digital Design component of this major have the opportunity to work with the Vine Street Campus’ motion capture studio, working in 3D animation. High school students in Fine Arts develop their skills through more traditional media with consistent integration of technology in the project-based course. Students not only gain a deeper understanding of fine art, design, and animation, but also establish a strong language for the craft while simultaneously strengthening their portfolios and developing their own unique style. The senior year capstone projects consists of a portfolio presentation in front of peers and faculty. It is a celebration of growth and achievement as students demonstrate they are the innovators of tomorrow. Desire to create, respond, express, and communicate visually. Learning to picture mentally what cannot directly be observed, and imagine possible next steps for making a piece of art. Be willing to stretch and explore in order to master the basic skills to be successful in any of the arts disciplines. Motivated to improve skill, expand thinking, and challenge oneself by persisting through setbacks, revisions, and obstacles. Committed to the development of Craft. Motivated to learn the techniques and skills to support creativity, as well as caring for the tools, materials and space necessary for making art. Willingness to show and share artwork with the community and put work on display for exhibition and critique. This is a technology based track that exposes students to the computer animation pipeline through a variety of challenging concepts. Students taking this course will use industry standard software and a production quality motion capture studio to creatively expose the basics of designing in a three dimensional space. 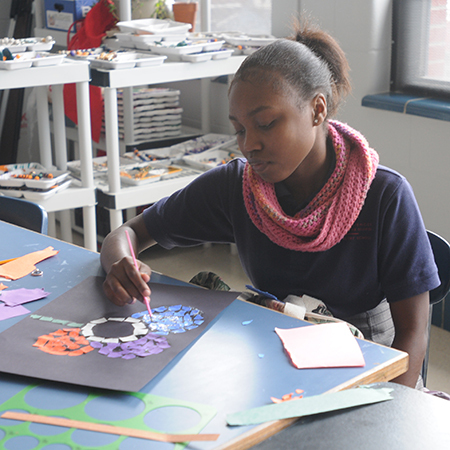 In grades five through eight, our Middle Schools, students continue to develop both academically and artistically. All content areas are now divided and taught by department, thus allowing students to experience each subject more thoroughly and distinctly. Novels are read through both independent reading and guided instruction. ELA, Math, Social Studies and Science round out the academic program. Students may take advanced classes in grades seven and eight. If students take Algebra in the eighth grade, they must also take the Keystone exam at the conclusion of the course. Beginning in middle school, each student chooses a major, and one block per day is devoted to the pursuit of content and practices in that major. For students in middle school, the Majors are introductory, and serve as preparation for the rigor of high school Major programs. Creative Writing and Digital Publishing. High School begins in ninth grade and concludes with graduation in grade twelve. A typical ninth grader’s school year consists of five academic blocks, one extended majors class, one lunch period, and one advisory / mentoring period. College courses — begins in tenth grade. String Theory Schools’ curriculum is aligned with the Pennsylvania’s Standards Aligned System (SAS), http://www.pdesas.org/, and the Pennsylvania Common Core Standards, www.corestandards.org. Both advanced and enrichment programs provide needed support for students who will benefit. Options exist for students who will benefit from other courses, including both advanced and remedial work. College programs exist for students beginning in tenth grade, and qualifying students are able to attend local universities for one course per term, in addition to the regular in-school program. Various schools, such as Drexel University and University of Pennsylvania, offer programs for our high achieving high school students. Visit our College Partnerships page. Electives such as Current Events and Forensics are offered based on interest, and announced in March of the preceding year for enrollment purposes.